The above passage is talking about observation aircraft active in the war in general, not just on the part of the Unites States, and when you consider the number of countries involved and the greater length of time others were involved in the conflict, it really makes one think that the combined loss of lenses during the war must have been significant. I have no idea, of course — it would be interesting to see if anyone does — if in the end more were lost than the number that were manufactured (and survived) that would otherwise never have existed had it not been for the increased production the war prompted. 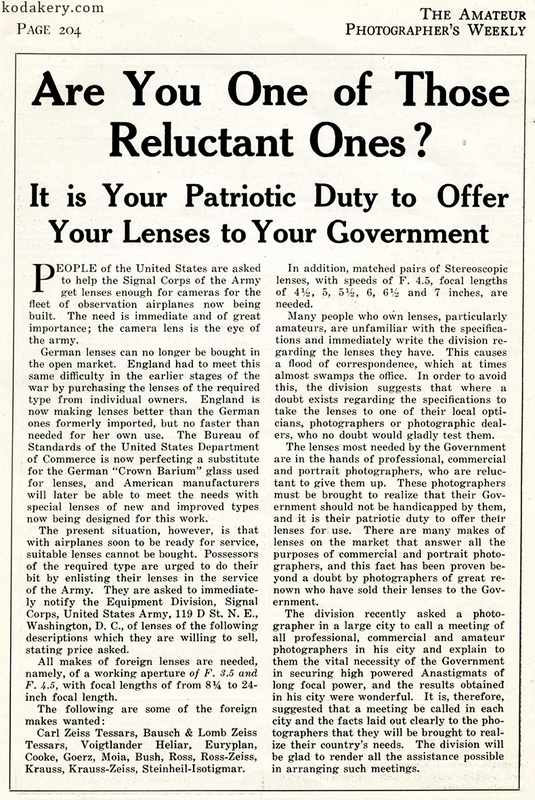 Perhaps the relative rarity and expense of vintage lenses of longer focal lengths (widely coveted today by large format and wet-plate portrait photographers) owes at least something to WWI, and to campaigns like this. Or maybe the war actually drove up production to the point that afterwards there were a greater number in existence — though even if that were the case, many unique and valuable lenses (and certainly many that were made earlier) would still have been sacrificed. It is also, I think, odd to ponder the prospect of a piece of glass that 6 months earlier may have been focusing an image of, say, a child in some Main Street portrait studio being blown to bits in the skies over northern France or Flanders. Here is the piece (click to open in its own window/enlarge).